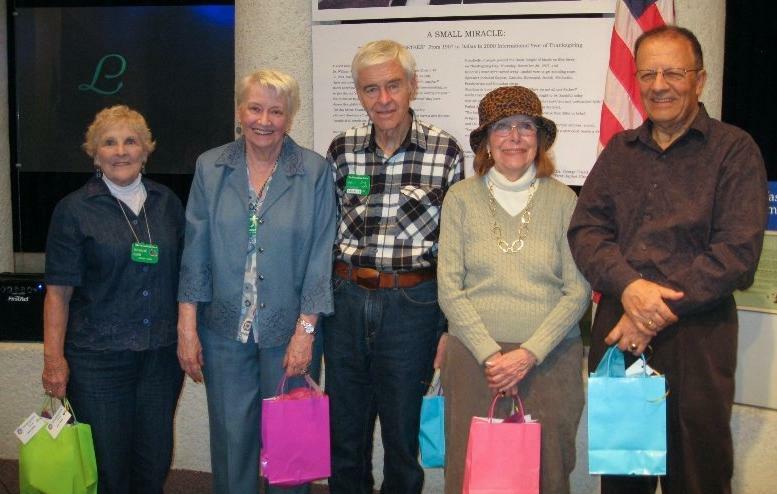 Mary-Helen Lyons, Mark and Virginia Bryant, Ward Head, LaNell (Koch) Naughton, Diana Bosworth, Barbara Lawrence, Dolores Nudds, Zia Shamsy, Ken and Betty Welland, Lee Fischer, John and Betty Holden. 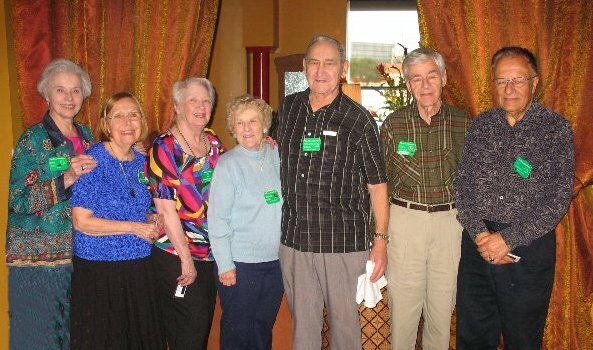 Joe and Jan Kuhl, Brud and Ann Kisner, Grace Morrison, Darwin and Myra Smith, Margie (Head) Tareilo and Dale Yost. 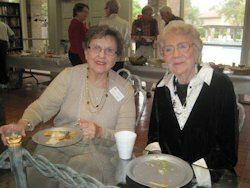 LaNell, who kept the sign-in roster at the initial November 28, 1993 meeting, explained that the Founders were the first officers of FFDallas, and that the Founders and the Charter Members were all present at the initial meeting. 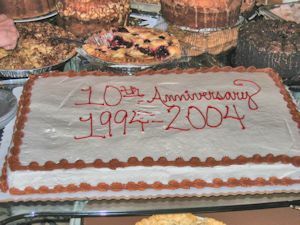 We celebrated our 10th year as a club in November, 2004 with an anniversary celebration at the Chimneyhill Clubhouse. We ate lunch at Cafe' Express in Mockingbird Station, then headed downtown by car and DART train to ThanksGiving Square. There we were treated to a tour of the symbolic grounds and building led by Tatiana Androsov, Executive Director. It was announced that FFD is now an associate group of ThanksGiving Square. 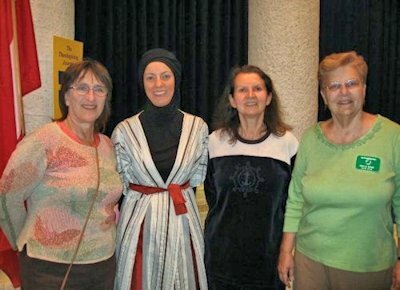 Our speaker was Elif Kavakci who sp oke about Thanksgiving traditions in Islam. This young woman is the daughter of the Imam at the large Mosque in Richardson and is also a wife, mother, college graduate, equestrian, and a designer of fashionable clothing for women who choose to wear Islamic dress. We learned that when Muslims pray five times each day, they always begin with thanks. Our speaker expressed thanks that she lives in America where she and others have religious freedom. We thanked our founders and charter members who attended, and presented gifts commemorating Friendship Force Dallas' 15 year anniversary. Honored were Jackie Bluhm, LaNell Naughton, Brud Kisner, Diana Bosworth and Zia Shamsy. 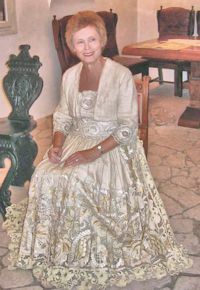 Mary-Helen Lyons (founder) attended the lunch, but not ThanksGiving Square. 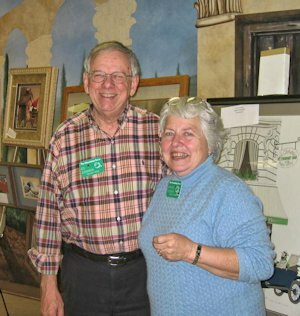 Founders Jerry Bluhm and Ann Kisner did not attend but were also honored. Thanks to Teresa Wilkin for arranging this informative and interesting program. 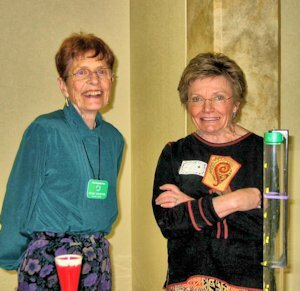 With the Fort Worth club we hosted the International Conference in Dallas in 2002. 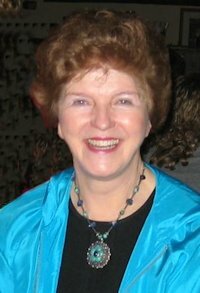 The Dallas Conference Coordinator was Marilyn Wilson. 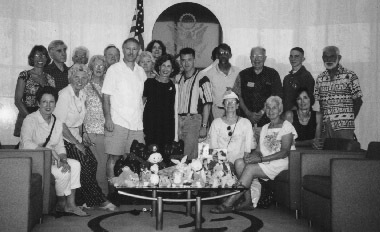 After the conference our two clubs hosted 44 people for a 4-day homestay. Constance Swank put together a program of highly respected speakers who addressed us during 5 plenary session and dinner speeches. Dr. Louise Diamond, a peace arbitrator, gave us copies of The Peace Book that we will circulate among our members. We heard how demographics alert us to a changing world. We learned that whether selling Coca Cola or Friendship Force what the world wants is connectedness. Personal endorsement is more effective than any kind of impersonal advertisement. Spreading the word of Friendship Force by telling others of our experiences is the way for the organization to grow. We were reminded that 1/6 of the world population is Moslem as we heard about the issues, beliefs and practices of that faith. 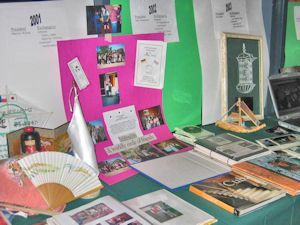 On the practical side there were "walking workshops" in a room set up with display areas and resource people to discuss various topics like fund raising, exchange booklets, special humanitarian projects, etc. Constance Swank and Chip Carter led a session on the new "transparent" funding of exchanges. Most of the meals were provided which gave us opportunities to eat and share ideas with different delegates. It was fun to see the familiar faces of those whom we had hosted or who had hosted us throughout the world. It was informative to meet with people from Hamburg and Cuba and discuss upcoming exchanges. 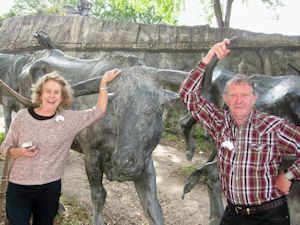 We are proud that two members of our Dallas club have served on the International Board – Mac Mackenzie (who was President of the Board), and Mary Suther. Both now live in Florida. 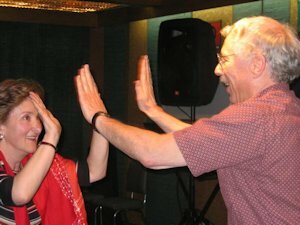 We have also had two Dallas members win the annual international award for Member of the Year – Ed Edgren, for his work in establishing two new clubs in Romania and in working with our BridgeBuilder project – supplying computers for the blind in other countries. 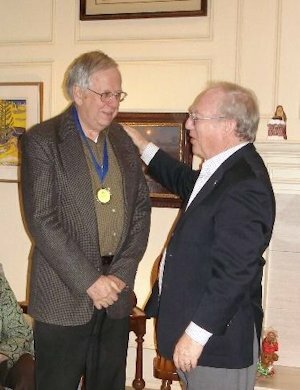 < He is shown here receiving his award from FFI President Mac Mackenzie. 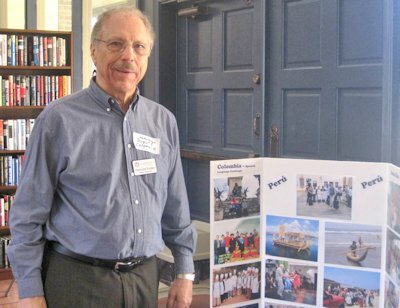 Bob Langford was honored as Member of the Year in 2013 for his work with establishing the club's BridgeBuilder project of supplying computers to schools for the visually impaired. Paula Rose accepted his award at the 2013 International Conference. 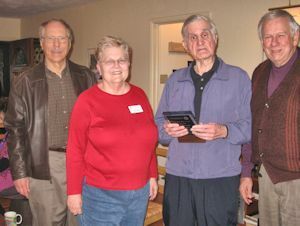 Bob received his award in Dallas at a special celebration. On March 1 we celebrate World Friendship Day with clubs participating around the world, beginning in New Zealand and ending 24 hours later in Hawaii. Thanks to Ann Harding in Devon, UK for helping with the initial concept. Thanks also to the hundreds of club leaders around the world who have organized their local events. 1. For our members to have an enjoyable time together in their local community, highlighting their Friendship Force experiences. 3. To raise money that will be used exclusively for the development of new clubs and to train new leaders. Our clubs are following a variety of methods for carrying this out: direct contributions, raffles, auctions, sponsors, etc. 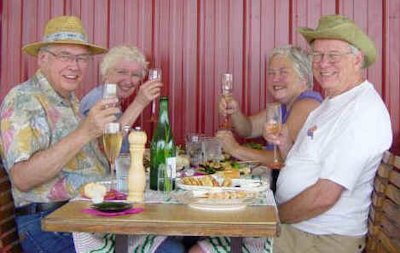 Some examples are beach parties in New Zealand, an ice cream social in Los Angeles, potluck suppers, banquets, afternoon wine and cheese receptions, backyard barbecues, and much more. With every participant worldwide making a small contribution, the total will be very significant. And remember, all of the money donated will go to creating new clubs around the world and to training new leaders! 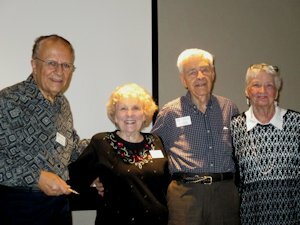 The most important thing to remember is that all participants should be given the opportunity to make a contribution knowing that they are joining thousands of fellow Friendship Force members around the world to create a Legacy Fund that will lead to a stronger Friendship Force for all of us to enjoy for years to come. The planning begins early, and by following three easy steps, your club can have a very successful event. - Contact FFI to confirm your participation in this important event. Use your regular communication channels or send an email to our special email address - aroundtheworld@friendshipforce.org. - Determine the type of event you will have. It can be as simple as a "pot luck" evening, or as elaborate as a catered banquet. - Determine price. Don't forget this is a fundraising event for the expansion of The Friendship Force. FFI is suggesting that $10 US be added to the cost per person as your contribution to the Legacy Campaign. But you can be creative in how to raise this money. Try a raffle, with prizes donated by local businesses; or look to local sponsors to help with the cost of the event. Make the fundraising part of the fun, with all members knowing their contribution will help in our common goal of creating a stronger organization. - Promote World Friendship Day with mailings to your club members. But look beyond your regular members. This can be a great way to introduce new people to your club. Include the media-they may be attracted to the fact that you are participating in a global event. - Be ready to go "on line" to add your event to all the others that will be taking place as part of our global celebration. If you would like some additional ideas or guidance on how to plan a great event-or if you want to share with other clubs what you will be doing on March 1 -- please contact us at aroundtheworld@thefriendshipforce.org. Our Dallas dinner/auction was a big success and we raised money for FFI and our own BridgeBuilder project. We had about 75 people in attendance. Late June, 2005: After picking a "full" basket of blueberries (way to go guys! 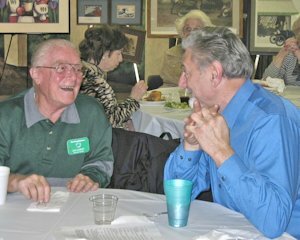 ), the Erbs and Edgrens enjoyed their Gourmet Lunch, which they had bargained for at the FFD Fundraiser Auction in March. Pickin' and eatin' was followed by a shopping excursion in the (don't blink) Village of Edom and Blue Moon Gardens - and it stands of record that Ed's basket was filled with the 'biggest berries' - according to Marge! See ya'all next year, hear? Auction item courtesy of the Terrells. 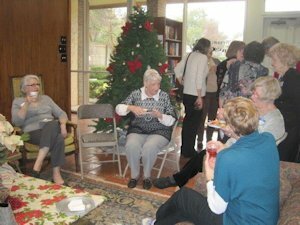 We met at Chimneyhill Clubhouse on December 14th to celebrate 20 years as a club. 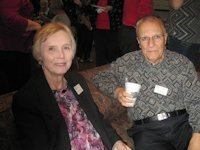 Founding members in attendance were Brud Kisner, Jackie Bluhm, and Zia Shamsy. Many long-time familiar faces were seen there to share the memories of our past 20 years. It seemed like yesterday seeing the photos in the presentation given by Mary Williams. Newcomers got an overview of how active our club has been and what we have accomplished. 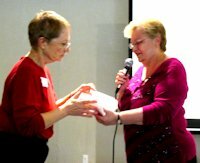 Paula Rose thanked members of the Board and committee chairs with a card and gift to Heifer, International in their names. She financed five flocks of chickens to help those less fortunate set up farming ventures. 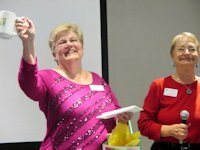 Paula was thanked with a present of gift cards and an FFI mug by the Board, presented by Felicity Sentance, incoming President. Thanks to helpers who set up and took down, and to Mary Latham who arranged decorations and Felicity who ordered the festive cake for the occasion. 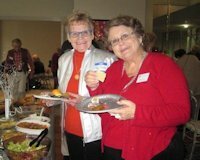 Mary Williams remarked: "I was struck in researching this presentation at how active our club is and what wide participation and volunteering we have. Love this group!" A pdf file of the presentation is available: Click on 20th Anniversary. 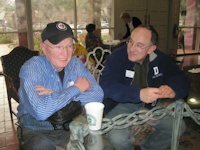 One program supported by the Dallas Friendship Force club is a Bridgebuilders program whereby we send computers to institutions for blind persons in other countries. It all started during an exchange from Vina del Mar, Chile to Dallas several years ago. 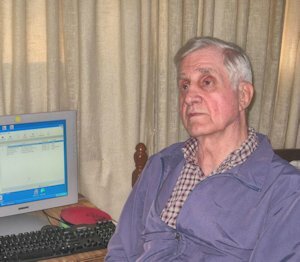 Maruja Corona from Vina del Mar, Chile heard about a Dallas Ambassador, Bob Langford, who happens to be blind and uses a computer. Bob also happens to be the president of International Services for the Physically Challenged which supplies computers to the blind and visually impaired in the U.S. This is just what Maruja wanted to find. Her grandson, Pablo, is partially blind and he was not doing well with sighted friends. 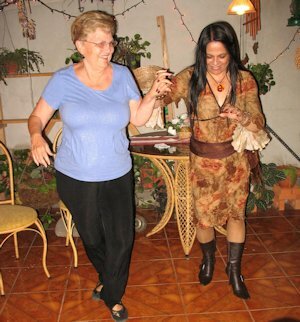 Maruja thought if he had skills that sighted children had, it would bridge the gap. Maruja and her home host, Ray Enstam, came to see Bob’s computer and to talk about how to help Pablo. After several conversations and discussions between Friendship Force Ambassadors, it was concluded our club was interested in helping. Many telephone calls and e-mail messages produced a plan that could help Pablo and the community of Vina del Mar. This was to be a computer center for the blind. Finally, the school for the blind in Vina del Mar, the Rotary Club, the local Catholic University, and the Friendship Force Club there were each involved in using their resources to create a room at the school for the blind with computers, a teacher, and technical assistance from the computer department of the university. 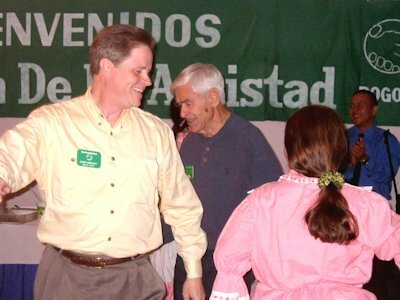 The Dallas Friendship Force provided the computers and the know-how to have an ongoing computer program for blind children and adults. 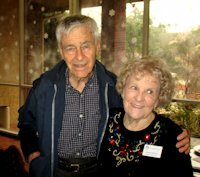 One year later, Ray Enstam and Doris and Bob Langford went to Vina del Mar for the dedication. 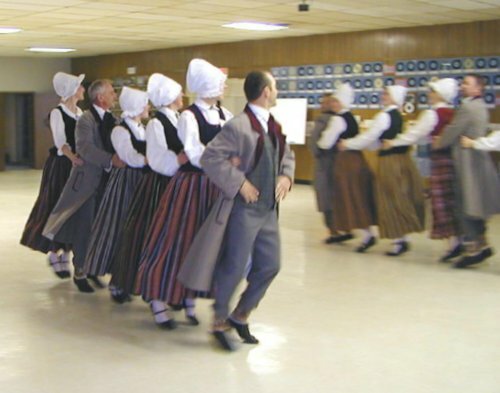 It was a major event covered there by local television and newspapers. Next, the Trujillo, Peru Friendship Force learned of this and the school for the blind there became very interested. Ray, Doris and Bob visited Trujillo and from this visit another computer center for the blind developed. The Helen Keller Foundation in Lima wanted to do the same for their students and this has happened with our help. 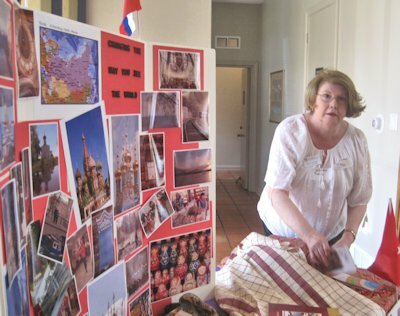 Cuba became an interested participant when the Dallas Friendship Force visited Cuba and talked with Rev. Noel Fernandez who continues to be very interested in developing a Computer Center for the Blind there. Legal restrictions on shipments to Cuba require prior approval of the US and Cuban governments, which complicates things. Nothing has been sent there yet. Ray, Doris, and Bob with others hope to go to Costa Rica and Nicaragua this fall to take more computers and to work with officials to complete the computer center plans in both countries. In April, 3 computers were sent to Sierra Leone for a school for the blind. A group in Dayton, Ohio has adopted the school for the blind there and sends a shipping container of clothes and medical supplies each year. They heard of our program and asked for computers that could be placed in the shipping container, avoiding customs problems. One of the big problems has been to get the computers into these countries. Customs can require a lot of paperwork even when the gift may be exempt from tariffs. Shipping can also be a problem. Air freight is too expensive. We have shipped some successfully by sea when the size of the shipment has been big enough to cover a substantial minimum charge. For small shipments of one or two computers, the most successful method has been for Friendship Force members to take the computers in their airline baggage. The computers have been collected as gifts. They mostly come from businesses that are upgrading their systems, but the used computers are more than adequate for the use we make of them, which does not require the latest technology. This worked well the first few years, but the demand now outstrips the supply and the International Services for the Physically Challenged now must buy computer components at an average cost of $150 per computer. 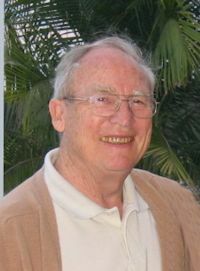 Bob Langford, President of the International Services for the Physically Challenged, has provided all computers for the Bridgebuilder program at no cost. 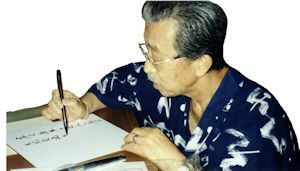 His organization has benefitted from the computers donated by Friendship Force contacts and activities and from an auction that netted financial assistance. A donated computer must undergo cleaning, testing, adding and replacement of components, downloading of many software programs, additional testing, packing and shipping. In the five years that computers have been sent to blind persons all over the world, a total of 625 computers with computer training material have been shipped to date by International Services for the Physically Challenged. About 20 of these have been in connection with the Friendship Force of Dallas for the computer centers for the blind described above. Another 10 are scheduled for delivery this year. The cooperation between the Dallas Friendship Force and the International Services for the Physically Challenged has made it possible for blind persons in other countries to obtain training in an area that will enrich their lives and lead, in some cases, to employment. 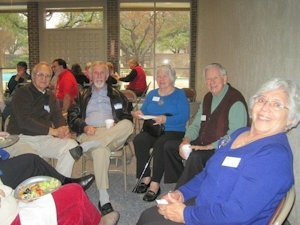 We in Dallas have, at a small price, helped other countries to help themselves thus creating a true bridge in the spirit of Friendship Force International. See the BridgeBuilders page for more information and results of this project as the years have progressed.